This is a special event hosted by Palo Alto High School’s Young Americans for Freedom club, where conservative students go to express their ideas in the liberal Palo Alto environment which is not always accepting of their beliefs. To the members of YAF, their small club is a refuge from what many of them see as a growing problem on Paly campus: opposition to free speech. According to Yasmeen Gavande, president of YAF, she and many of her conservative peers feel restricted in what they can say at school. Over the past several years, the debate over free speech on school campuses has become increasingly contentious, and a Gallup study published in March suggests that these conflicts reflect a changing attitude toward free speech within our generation. According to the survey of over 3,000 college students, 70 percent of students surveyed said they favored an open learning environment that allows free speech — a significant number, but down from 78 just a year ago. And 53 percent believed that “diversity and inclusion” are more important than free speech. These numbers are far from an indication of sweeping change, but they raise important questions about the state of free expression among today’s youth. And on the Paly campus, students are grappling with these questions themselves. With over 2,000 students at Paly, it is not difficult to find people with contrasting political ideologies and interpretations of constitutional freedoms. 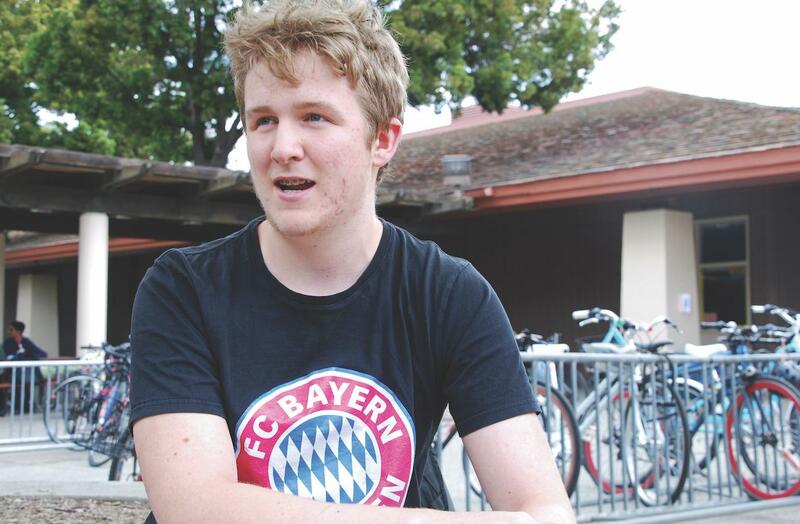 Freshman Owen Longstreth, who describes himself as a Marxist, is just one example of a student who freely expresses his unconventional beliefs at school. “Generally I feel like I have a right to express myself … I feel comfortable talking openly,” Longstreth says. However, his openness comes at a cost — Longstreth says not all people take him seriously. However, Longstreth says Paly offers many platforms for political expression. “I think we do have good free speech, especially on this campus, with all of our publications. People can express themselves any way that they want,” Longstreth says. Gavande sees the campus environment differently. As president of YAF, she says that she and other club members have had disturbing experiences with free speech around campus. Junior Alicia Kao is hesitant about allowing free speech to go completely unrestricted, but she agrees that Paly’s climate surrounding political discussion needs to change. “I think that that we shut down way too many people,” she says. “Certain liberals will not listen to Republicans and the same thing the other way around.” She doesn’t believe that people need to agree with a viewpoint in order to listen to it. Paly isn’t new to issues with free speech. During the tumultuous 1960s, students protested against the Vietnam War, and publications like the Radical Rag became new, illicit venues for student expression. Chris Kenrick, who attended Paly from 1967 to 1970, wrote for The Campanile, and now works as a journalist for The Palo Alto Weekly, remembers the turmoil of her high school years. Kenrick sees significant differences between that period and today’s debates surrounding open expression. “I don’t think we had the kinds of free speech issues that you’re [students] having now,” Kenrick says. She says the pattern of provocative college speakers, for example, is a new phenomenon, as is the idea that students can be shielded from offensive ideas. “I don’t think students need to be protected from certain types of speech,” she says. “They’re intelligent people that should be learning from different types of speech.” But Kenrick places most of the blame for the recent controversies at the feet of “provocateurs” who, she says, deliberately stir up conflict. “It seems like maybe we have to relearn how to do it [discuss ideas] in an inclusive and respectful way, rather than a way that’s just going to further polarize people and hurt people and inflame people,” she says.